This editorial was originally published on The Huffington Post Blog, by Daniel Wagner, CEO of Country Risk Solutions (CRS) and author of the book “Managing Country Risk,” and John Bugnacki, an Adjunct Fellow with the American Security Project (ASP) and a research analyst with CRS. One of the United States’ greatest successes in its recent policy toward conflicts in Africa was the Bush (II) Administration’s role in brokering the Comprehensive Peace Agreement that put a formal end to the Second Sudanese Civil War, which had dragged on from 1983 to 2005. The Second Sudanese Civil War was one of the most destructive wars in recent history, with most estimates placing the death toll at more than two million, and involving countless instances of human rights abuse, crimes against humanity, and war crimes. At the end of that War, the battle lines were drawn between the northeast of Sudan, which was poor but controlled the vast majority of government offices, and the country’s south and west, which had little governmental representation, but was resource-rich. Ethnic heterogeneity, the discovery of oil, and the legacies of colonial rule were all direct factors in sparking and sustaining the War, but those precursors did not disappear once it ended. Through these agreements, the Sudan Liberation Army (SLA) — one of the major armed groups fighting the government in Darfur — agreed to lay down arms. However, as the Sudanese government failed to follow upon on promised provisions, some of the SLA’s leaders have returned to fighting alongside other groups who have never conciliated with the government, such as the Justice and Equality Movement (JEM). 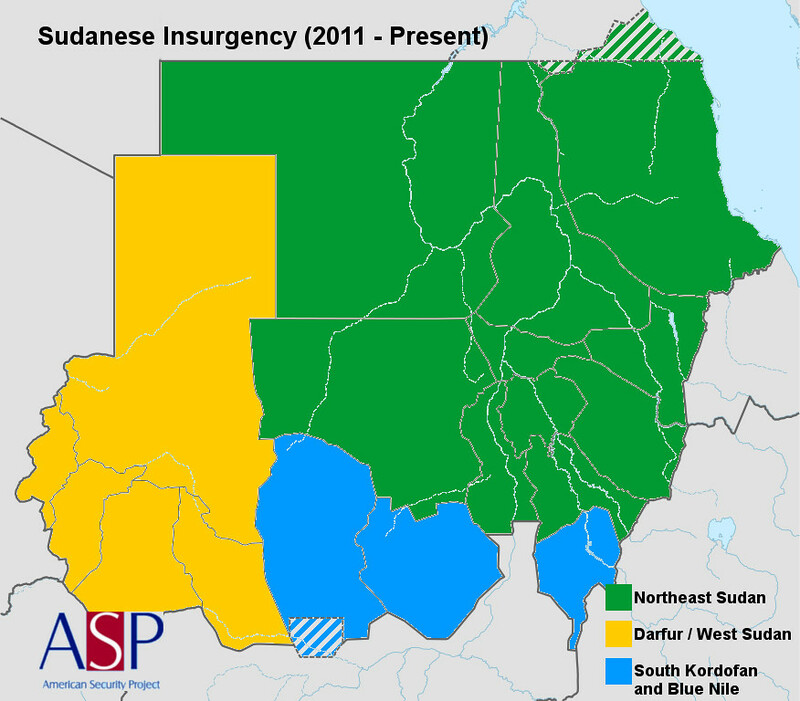 Even though groups such as JEM have expanded their reach from the West into parts of eastern Sudan, they have been generally unsuccessful in claiming territory from the regime. However, groups like JEM do appear to be reasonably successful in acquiring light and heavy armaments, having stolen them from the Sudanese army, and have amassed large stockpiles of weapons. JEM, SPLM-N and other groups have the arms and momentum to continue to fight Khartoum, but do not have much to show for it, either in terms of territorial gains or having forced the regime to meet their demands. With the secession of South Sudan, much of Sudan’s oil wealth has disappeared, and the state has had to roll back its generous subsidy programs that it used to attempt to placate civilians for perceived widespread corruption and the lack of political freedoms. Similar to the behavior of most rentier states during boom times, Sudan made few investments in human capital and preferred to spend lavishly on unproductive or wasteful enterprises. As the country’s recent economic decline seems to be coinciding with increasing civil unrest against the government, Sudan is attempting to avoid revolution at home by pursuing increased engagement with the outside world, and very much wanting to leave the impression that it is breaking out of its radical, isolationist past. As Bashir continues to refuse to reform, Sudan continues to experience a sharp increase in civil unrest. According to the ACLED (the Armed Conflict Location and Event Data Project, a public database of political violence in African states), over the past few years there have been marked increases in both the reported incidences of protests, and government violence against civilians. Most of the major armed opposition groups, such as the SPLM-N and JEM, have become functionally united under the Sudan Revolutionary Front (SRF) banner. These armed groups and civil society organizations are calling for democratization, federalism, and the removal and prosecution of President Bashir for his alleged crimes. In the wake of protests against the rollback of subsidies in 2013, a number of government officials expressed opposition to the regime’s violent crackdown. Bashir subsequently fired the officials who had dissented and surrounded himself with his closest political allies. While the government has repeatedly announced multiple national dialogue initiatives, they have resulted in little progress, and some political analysts suspect they are aimed primarily at imbuing the government with a false sense of legitimacy. The Sudanese government continues to deny testimony from international observers, such as Human Rights Watch and UNAMID, that it is continuing to oppress and terrorize its people. Bashir is also the only sitting head-of-state who has been indicted by the International Criminal Court (ICC), which has charged him with genocide, crimes against humanity, and war crimes in Darfur. The ICC recently halted its investigations into Darfur and Bashir to focus on other cases, leaving little prospect of prosecution, and giving Bashir even less incentive to change his tune domestically. Indeed, given that he won the presidential vote earlier this year with 95% of the vote (which has of course been contested by international observers as grossly fraudulent), Bashir may be expected to continue to rule Sudan with an iron fist and not embark on meaningful political reform. Only a change of leadership will open the door to that prospect.